Qigong (Chi Kung) classes are particularly geared to the beginner, offering a variety of self-healing and energizing exercises. 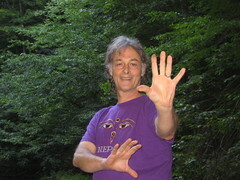 Individual & small group, in-depth study of qigong with Zayne are also offered. These simple ancient Chinese practices consist primarily of slow, steady and smooth movements (the three S's) combined with breath, awareness and mind intent. Learn how to cultivate your vital life force, activate natural healing processes, foster a sense of peace and integrate the practice into your daily life. Zayne's teaching: Informative, Inspiring, Playful!